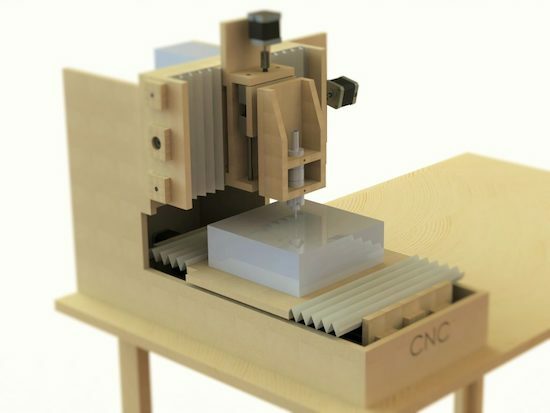 Using an Arduino Uno with a CNC shield, Thimo Voorwinden has made his own CNC out of MDF for just over €200 ($212). CNC routers really open up what the type of item you can make, but tend to be expensive. Voorwinden’s homemade version, however, features a work area of 200mm x 250mm x 100mm. As shown in the results video below, it’s accurate enough to cut two pieces of MDF so that they can nest securely inside of one another. Impressively, the whole assembly was created using basic tools. Two interesting features on this build are that the workpiece is fastened down with wood screws into the Y-axis gantry, and that it employs an offset motor with a flexible shaft to transfer power to the cutting head. 12 bearing blocks and 8mm diameter steel rod are used to keep everything lined up. You can see more of this project in Voorwinden’s write-up, including several other videos as well.